Stem stitch is one of the most common and basic embroidery stitches. It is used frequently in surface embroidery, freeform embroidery, whitework, redwork, and more. This stitch creates a thin line and can be used to outline embroidered shapes, to form flower and plant stems and a variety of other applications. Stem stitch is easy to work in a straight or curved line, making it suitable for so many embroidery designs, such as the free stem stitch butterfly pattern. Insert the needle one stitch length away from point 1 and just below the pattern line (point 2). Come back up a little less than halfway between points 1 and 2, just above the line (point 3). Repeat this process, going back down just below the line at point 4. You can also work the stem stitch using the stabbing method. To do so, don't pull the first stitch taut until you bring the needle up for the next stitch. Take care to keep the working thread below the line of stitching. A thinner line can be achieved by working the stitch directly on the line, rather than slightly above or below it. Some stitchers find that they can achieve a nicer line of stitching by working this similar to back stitch. If you struggle with stem stitch, try this method instead. Come up at point 2 and go down at point 1, then come up at point 4 and go back down at point 3. This is especially helpful when working directly on the line. Stem stitch can be worked tightly or loosely, depending on your preference or project requirements. To work along a tight curve, or to work a smooth line, take smaller stitches. For a rustic or open look, take longer stitches. The look of this stitch also changes depending on how much each stitch overlaps. For example, a large overlap will have the ends of every other stitch touching, with the middle stitch covering this. A smaller overlap will leave a gap between every other stitch, again, with the middle stitch covering this. You'll see this most clearly when you look at the back of your work. To work stem stitch as a filling, stitch rows of stem stitch close together. Continue stitching enough rows to fill the desired area. Quite often, this stitch is confused with outline stitch, with the two names being used interchangeably. This is understandable because they are almost identical and in most cases either will work. The main difference between these two stitches is where the working thread is while you take each stitch. 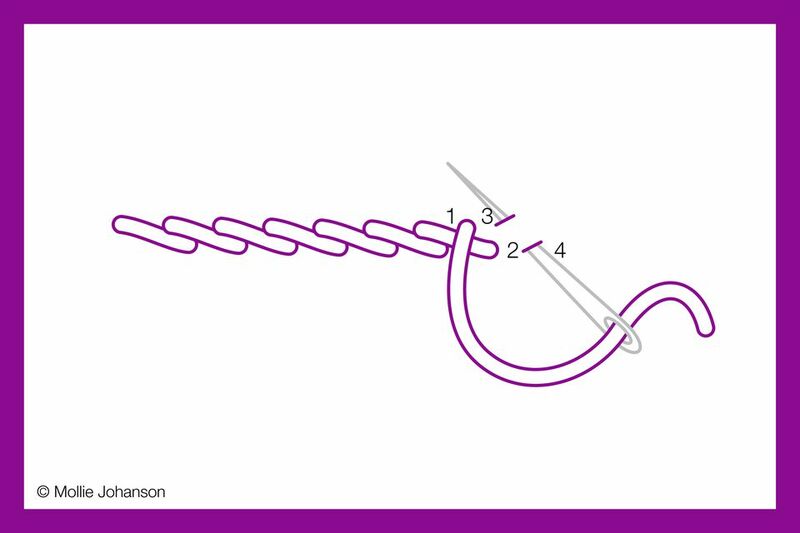 When working stem stitch, the working thread always remains below the line of stitching. For outline stitch, the working thread is always above the line of stitching. The result of outline stitch is that the individual stitches are angled in the opposite direction of how they are with stem stitch. Because of this, as you work the stitches, you will want to come up just below the marked line and go down just above it.